Figures 442 (upper) and 443 (lower) from Chapter 16 (Cytoplasmic matrix and cytoskeleton) of 'The Cell, 2nd Ed.' by Don W. Fawcett M.D. 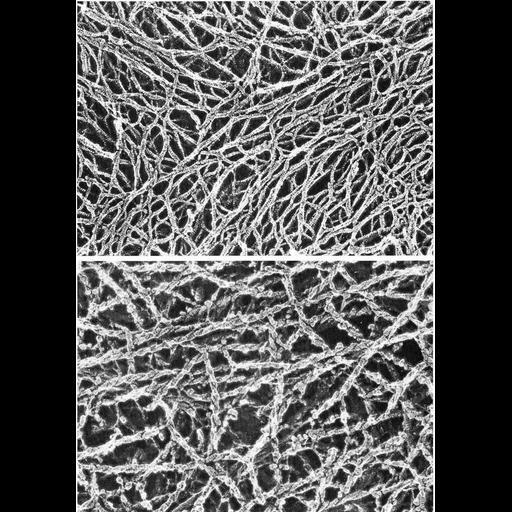 Purified preparation of actin undecorated (upper) and decorated with heavy meromyosin (lower). Purified actin consists of a network of filaments that show periodicity similar to that seen in the cytoplasmic matrix. Actin decorated with heavy myosin takes on a rope-like helical disposition of the attached myosin fragments (lower). Images by John Heuser. A PDF copy of the accompanying chapter is available on the ASCB’s BioEDUCATE website.